Philippines has only two seasons: summer and rainy seasons, we don't have spring season, so... bring on the Spring! I like Spring, it's very romantic, so beautiful... and I love the colors, I love the shape, I love everything about it basically! My wardrobe is very colorful - 85% of my spring/summer clothes are fun colors or patterns, with very few neutral outfits. You'll notice that if you're a long time followers of my blog. 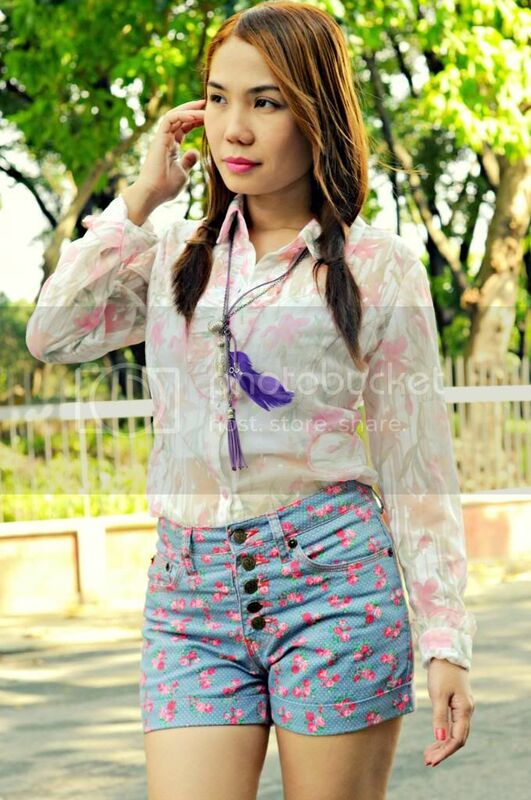 I love the result of this floral on floral print outfit. It really pops out and adds the spring feel to this whole outfit. I almost feel that Spring season is in the air! you're just super cute in this flower-flower combination! Cute and girly, I like your shorts! Hurray for colours and your shorts are so much fun! I was kinda riky but I kinda like it. Those shorts are lovely. Very bright and bubbly outfit! Great mix of prints! I love those pink shoes!